This film, while pretty good as sequels go, has neither the characters, atmosphere, nor scares of its predecessor. It continues precisely where the other left off, and reveals a little more about Michael Myer's past. 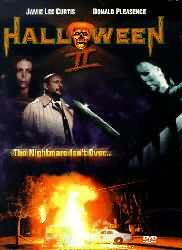 The fact that virtually everyone from the first film returned, yet John Carpenter didn't direct it, may be the reason this is inferior. Jamie Lee Curtis, looking much older since the first film, has almost nothing to do. She crawls, she whimpers, she gazes dazedly into space, she hobbles...none of which inspire us to like her as we did in "Halloween." Dr. Loomis' ravings about Michael, so effective and chilling in the first movie, seem less coherent and inspired here, as if he's a little crazy himself. Michael's destruction is cool, but the fact that he cannot be stopped by bullets in one scene, and yet is incapacitated by them in the next doesn't quite jibe with me. In viewing this episode directly after the first, I start to wonder what Carpenter & Hill had planned all along, and what was added later. Specifically, the whole "little sister" subplot is puzzling. The opening 'Skull inside pumpkin' shot is cool. And the ending isn't too bad. Some folks have told me you can spy SNL's Dana Carvey in a scene or two, so keep an eye out. Best Scare: A naked nurse kisses Michael's hand. Yuck! I'd Recommend It To: Most fans of the first film. This is really the kind of sequel that makes sense. Halloween drops us with no real sense of closure even though it is complete in itself. 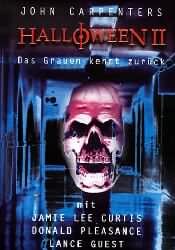 Halloween II picks up right where it left off and finishes the story of that fateful Halloween night. Finishes it to the point that I wonder how anyone could justify sequels. 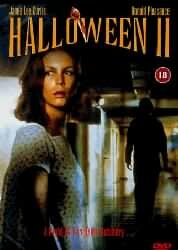 The biggest weakness of Halloween II is that Laurie Strode is a wimpering cowering shell of her Halloween self. 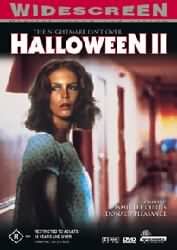 She just isn't the Laurie Strode that we loved and the fact that they kept her drugged out of her mind is a pathetic excuse. It didn't heighten the terror at all. The second biggest weakness was the location. I've been in a few hospitals, small town hospitals even, and I've never seen one that deserted and that dark. The only patients other than Laurie were some newborns? Come on. They could have at least shown a few patients sleeping in a ward as Michael walks past. The final weakness was Dr. Loomis himself. He is almost neurotic here in his pursuit of Michael and often overreacts to situations that didn't stir him in the least in the first movie. I don't think this is Mr. Pleasence' fault at all. I think that some of the vision that John Carpenter brought to the first movie is simply lost when he didn't return to direct. The movie degrades into the traditional slasher free for all. It is unfulfilling in a lot of ways, but tt certainly isn't my least favourite of the series and all in all it really isn't that bad of a movie. Even with the problems you have to remember that it is trying to live up to a huge legacy and will invariably fall short. It is totally worth watching them back to back, but only once in a while.